Even if you like to brag about your visual memory, your recall may really depend on the direction of your gaze. That's what two MIT scientists say after testing people's recollection of items on a screen. We're OK at remembering where an object was in space. But we're better at remembering where it was in our eyeballs. Brain researchers Julie Golomb and Nancy Kanwisher were interested in two types of visual memory. The first is called "spatiotopic": related to space. This would seem at first glance (ahem) to be the type of visual memory we use most often. We reach for a coffee cup while scanning the computer screen; we recall where in the kitchen we set down our keys. The second type of memory is "retinotopic": related to the retina of the eye. In this case, we recall an object's position relative to the direction of our gaze. The researchers performed a series of tests on their subjects. In all the tests, subjects first stared at a gray computer screen and saw a white dot appear. Subjects had to focus their gaze on the dot; an eye-tracking device made sure there was no cheating. Then a small black box briefly appeared somewhere else on the screen, while subjects kept their eyes on the white target. Next, the black box disappeared, and the white dot either stayed in place or began to travel around the screen. It moved to zero, one, or two other spots, requiring subjects to follow it with their eyeballs, before landing at its final position. Then subjects were asked one of two questions: Do you remember where the black box appeared on the screen? or, Do you remember where the black box was in relation to where you're looking now? 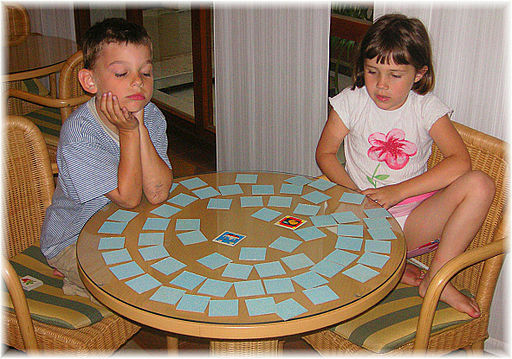 The first question tested subjects' spatiotopic memory; the correct answer was simply where the black box originally appeared. But the second question tested retinotopic memory. So, for example, if the black box had originally been to the lower left of the white target, the correct answer was to the lower left of wherever that white dot ended up. As the white dot made more movements around the screen, subjects made more errors in their spatiotopic memory (Where was the black box on the screen?) This isn't too surprising. Following the white dot to more locations made subjects lose track of where the black box had originally appeared. But while people's performance on the spatiotopic test got worse, their performance on the retinotopic test (Where was the black box in relation to where you're looking right now?) stayed exactly the same. To make sure the subjects weren't just using the white target dot to anchor themselves, the researchers tried leaving a ghost of the original target on the screen while the white dot traveled around. This ghost dot could have helped subjects to anchor their spatiotopic answers too. But the results stayed the same, suggesting that subjects were really succeeding in the retinotopic task by anchoring their answers to their eyeballs. This seems like a non-optimal way for our species to remember where things are. Since our gaze is always moving around, it would make sense for our memories to ignore that variable. But the authors suggest that this might just be the best evolution could do with the tools available. Keeping an accurate map in our heads would be hard. Perhaps instead, we record our visual memories with reference to our retinas, and try to update them as our gaze moves around. The more movements our eyes make, the more we lose track of where we saw something. It's not perfect, but we do a pretty good job of finding things in everyday life. The study was small, so it would take more evidence to show for certain that our gaze-related memory is stronger than our space-related memory. If true, there would have to be some handy applications. Maybe gaze-related memorization tricks would be the new mnemonics. Or maybe, after we've seen something we want to remember clearly, we should freeze our gaze in one direction and not move. Of course, that wouldn't help with the coffee cup, but it might make you a champ in a game of Memory. This study fails to account for extended, or long term photographic memory. I'm not entirely sure how you would test for that. Or does that fall into the "really good memory" pile? No, you're right, the study doesn't examine long-term memory. It doesn't look at any real-world memory applications either. E.g., how does this apply when people are looking at objects in a room, rather than dots on a screen?